Have you ever wondered how many people would still love you if you were no longer beautiful? Have you ever thought of people who wake up and can't stand the idea of seeing their reflections? Have you ever considered that death may be easier than life? I never did. Not once. Not until one moment, one mistake, changed my life forever. I woke up to beeping machines, hovering faces, and pain like you wouldn't believe. I'm not just talking about my burns either. I'm talking about my heart. My name is Sarah Jordan and this is my story. I'm tired of pretending to be perfect. Of painting on a smile when I'm struggling. My story isn't always pretty and easy to read, but it hasn't been easy to live either. I'm opening up. Letting you in. So maybe, just maybe, together we can peel away the masks and find true beauty. True life. Underneath it all. Welcome to my heart ... bound within the pages of Bloom. Book 5 in The Unspoken Series. This is a 10 book series, best when read in order. A beautiful, successful, sweet personality with the world at her fingertips, Sarah Jordan falls in love with James, a charming man who adores her. But he comes with broken pieces and a daughter he adopted when his brother and sister-in-law died in an accident he feels he could've prevented. When she finally decides to say yes to his many proposals, they are both burned in a campfire accident. After a year of hospital beds and stark lights, Sarah is released to go home with everything but her former beauty. As she recovers, James struggles with regret and guilt as Sarah fights to overcome the depression that comes with a new life so different from the one she loved so much. Her joy and security are tested while budding relationships cleanse wounds they never knew they had. Marilyn Grey just keeps getting better with each book. 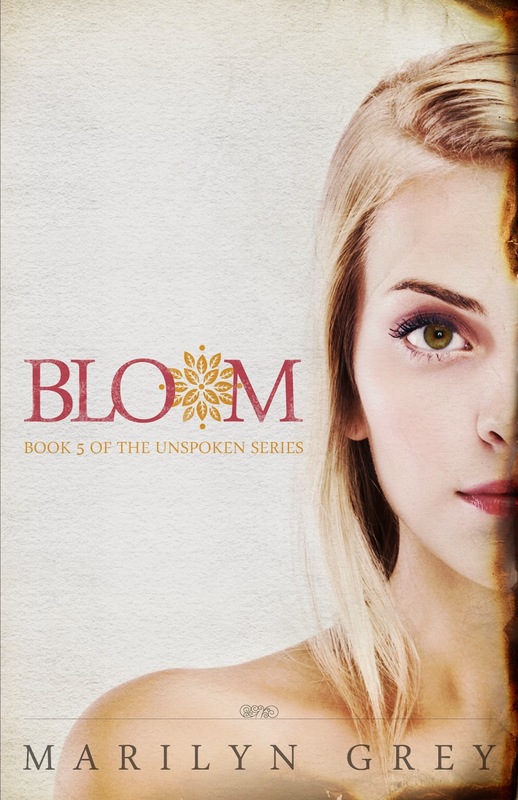 Bloom is a story about beauty. How do you measure the beauty of something, of someone? Is it just the pleasantness of the outward appearance, or the glow that lights from within? Sarah Jordan is an excellent photographer. She’s a people-pleaser, and she sees the beauty in even the ugliest thing. She used to be a head-turner because of her beauty, but when a forgotten camp fire crawled its way to the tent she fell asleep in and licked a large portion of her skin, taking her beauty with it, she starts seeing negative things more because how can you see the beauty in things when you can’t even find it in yourself? Now Sarah is recovering and coming to terms with the fact that the beautiful woman she once was is no longer the woman she sees everytime she looks in the mirror. All she sees are the scars that mar her body. Gone is the girl who sees beauty in everything. One of the things I love about Marilyn Grey is her knack in tackling the issues of life in every book. She does it so simply but when you take the time to not just read but absorb the whole content of the book, you realize that the theme is beautiful and the books get you thinking about life and its issues. I thought nothing could be better than Heart In A Shoestring, but I was wrong. Ms. Grey just took it to a whole new level of awesomeness. The way Sarah pondered about the true meaning of beauty makes the reader think along with her. For me the essence of the story is very realistic, making it easier for the reader to relate and appreciate the book and its ‘lessons’. A lot of people is so concerned about outward appearances and they obsess about always looking beautiful and pleasing to the eyes. Nothing wrong with that, but people tend to forget that beauty is something that cannot be seen or touched. Some people take their beauty for granted and they don’t realize how much they want it until it’s gone. Beauty is something that comes from within, and I think Bloom portrayed that very well. Like when Sarah is so obsessed with hiding her scars, she doesn’t think of anything else aside from negative thoughts. But when she laughs, when she’s happy and feeling alive, that’s when people see her as beautiful because then the scars don’t matter. Of course, this book has its…downfalls. I think Anastasia is too witty and smart for a nine-year-old kid. Her story was told, and it might have explained it some but I think for a nine-year-old she needed to be toned down a little. The writing style is okay to me, but sometimes there are too many punctuation marks (periods) and the sentences could have been better in a complete form. Aside from that…I like the book. A lot. Another thing about Marilyn Grey is so good at is giving a glimpse of the other characters’ story enough for a reader to understand what’s going to happen in the next books but at the same time not revealing too much to give satisfaction to curious minds. You can guess and guess but with Ms. Grey you can never be sure because she has a way of surprising her readers. The lady knows how to twist a story. This is how you write a book. I just can’t imagine how much I’m going to like When The City Sleeps. This series is sure something that should be on a bestsellers list.